This site will be incrementally converted to a new site, which will be prepared in two languages: in Russian and in English. This is the first page of Russian version. This is useful page of Russian version. This is the first page of English version. Этот сайт будет постепенно заменен новым сайтом, который будет приготовлен на русском и английском языках. Это первая страница русской версии. Это полезная страница русской версии. Это первая страница английской версии. Countries recognized by some nations: Abkhazia, Kosovo, Turkish Republic of Northern Cyprus. Self-proclaimed state: Transnistria - Pridnestrovian Moldavian Republic. Special administrative regions: Hong Kong, Macao, Taiwan. Visited in Europe: all countries (there are totally 45 countries in Europe). Visited in America (all parts: North, Central, South, and Carribean islands): all countries. There are totally 35 countries in America. Visited in Asia: the majority of countries (37 from 47 countries and this number does not count Russia). Visited in Africa: 32 from 54 countries. Visited in Oceania (Pasific area): 13 from 14 countries. All countries that are considered to be visited are UN members and United Nations General Assembly observers. 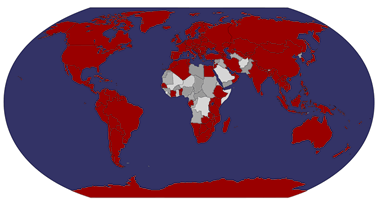 The total number of UN members is currently 193 (July, 2018). The distance between the most North and the most South places is more than 18 000 km (to be measured on meridian). They are the Moffen island in Spitsbergen (80 degree North) and Antarctica. Up to the 8th of July, 2018 I visited all seven continents: Africa, Antarctica, Asia, Australia, Europe, North America, South America. I went to all these places and they were fantastic!